Viking Lotto is a venture of national lotteries from Norway, Sweden, Finland, Denmark, Estonia, Latvia, Lithuania and Iceland. On the right picture: Viking Lotto player choose her/his lucky numbers. Such co-operation created a unified lottery game with a bigger first prize and wider participation of players. Viking Lotto proceeds are transferred to support local communities of each of the eight participating countries. Finland is known for donating money towards the arts, science, and youth activities. That's the way Finns spend more money on playing Viking Lotto than local Finnish Lotto. Other Scandinavian countries also follow this trend. Profits from Viking Lotto goes to support usually non-profit organizations e.g./ the Danish Organization for Disabled People. On the left: Picture from Viking Lotto television commercial. When you are going to play Viking Lotto, you have to choose 6 numbers from a guess range of numbers from 1 to 48. After main six numbers are drawn, next two bonus numbers are drawn from the same drum. This bonus number counts only towards the second prize of 5 + 1 and sometimes are called the Lucky Numbers. When you wish to buy your lottery ticket online with us, the ticket sales close approximately three hours prior to the draw. Viking Lotto draws take place in Norsk Tipping, Hamar in Norway on every Wednesdays at 20:25 (8:25pm). 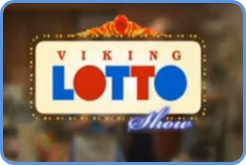 Viking Lotto results are available live television in all participating Scandinavian countries and also are available on this page, a few hours later. The odds of winning of the smallest prize in Viking Lotto are as 1:53 and you need to hit three winning numbers to win 5th division (smallest) prize. That's very possible to happen often. Viking Lotto’s biggest jackpot of €15 Million, was happened in March 2010. All Viking Lotto prizes are paid in a lump sum (cash) and there is no tax requirement. Lower prizes below €20,000 must be claimed within one year, and prizes above €20,000 must be claimed within 3 months. There are jackpot roll-overs feature available. If no one wins the jackpot, then Viking Lotto roll-over feature is used. The jackpot money are added to the first prize money pool of the next draw. However, if you want to win the jackpot (mean first prize), the odds of winning are as 1:12,271,512. You will find the winning odds table on the right. It shows all odds of winning in all divisions available in this Viking Lotto game. Please check the latest Viking Lotto results, upcoming next draw date and upcoming jackpot figure, right below or at the beginning of this page. Please bookmark or save link to this page for the future reference and convenience. Our partner theLotter offer the possibility to buy Viking Lotto tickets online, from any place in the World. As well, many other European lotteries are available to play online, using credit card, debit card and other electronic payment methods, including PayPal, Skrill/Moneybookers or bank transfer. 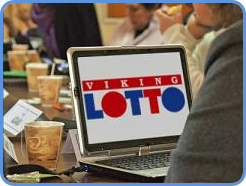 You can buy Viking Lotto tickets online, easily, simply and fast. All you have to do is to click "PLAY" button above, or please click the button below. There are more lottery tickets available online. Please scroll down to play other European lottery games. Enjoy! Please click the link below to find the full list of American lottery games available online. Please click the link below to find the full list of the biggest lottery games from around the world, available online. Freezing and cold Scandinavian winters do not disturb loyal and regular lottery be-lovers, in playing the world's first multi-national Nordic lottery called the Viking Lotto. Sharing Nordic Viking heritage, Scandinavian countries formed the unified lottery game in March 1993. For sure, this move created biggest first prizes (jackpots) and attracted more players. On the left picture: Viking Lotto logo shown in TV commercial. Viking Lotto game got boost when three Baltic countries: Lithuania, Latvia and Estonia joined this game in years between 2000 to 2012. This game is so popular in the region that many Russians play Viking Lotto, either by visiting Baltic countries in person or do it online. Wider audience and larger jackpots will continue to attract more and more players. This is real fact that Finns spend more money on playing Viking Lotto than national lottery game called Finland Lotto Veikkaus. Two multi-national lottery games, mean Euromillions and Eurojackpot followed this modern game structure after seeing the success of pan-nordic Viking Lotto. It seems that transnational lotteries got momentum and this trend will grow in the coming decades. Please note that Viking Lotto has a very good cost/benefit ratio, great winning odds and tax-free prizes paid in cash. Such facts also play a big role when comes to purchasing lottery tickets online, by players from various countries from around the globe. If you like, you could visit another special page dedicated Viking Lotto, where more information available about this exciting game. 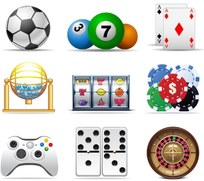 You can try your luck by playing lotto game online. Buy your European lottery ticket online using services available on this page. Please go to the top of this page. 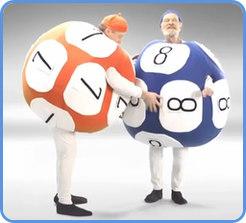 Please watch interesting and funny Viking Lotto TV commercial on video shown below. This commercial was developed in Russian, in order to attract more players from Russia. Enjoy!